I am soooo excited about next weekend, as it is The Great British Craft Festival time again, and, with a new venue! The new show is at the Bolton Arena, Horwich, BL6 6LB on Sat 31st May (10am - 5pm) - Sun 1st June (10am - 4pm). Our stand is 34A, opposite the seating area with a handy cafe pod! 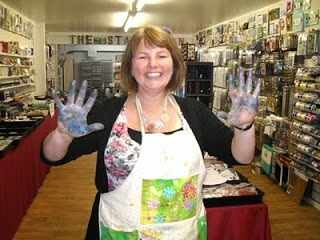 I am soooo excited as we have Francoise Read, designer of Woodware stamps (above), and, Sarah Anderson, one messy, messy lady! (below), demonstrating on our stand. They are both very dear friends of Ian and I, and I know we will have so much fun at the show! Good for you! I hope you have an excellent time at the show and hope to see some great creations! Lol, I've seen some pics of on blogs lately with people claiming to have messy hands and each time I've disagreed with them (just to myself you understand!) ... I do have messy hands!